We first heard about Cortana-Alexa integration when Microsoft and Amazon announced the same back in August 2017. Cortana-Alexa integration would allow Amazon Alexa users to access Cortana and Cortana users to access Alexa. There was a lot of work to do here as such a collaboration between two big companies has a lot of formalities to sought out. Well, it seems as though the companies have finally figured out everything. Microsoft at the Build 2018 conference, finally, showed off Cortana-Alexa integration in action. The demo showed one user at his office and another user at her home. The person at her home had an Amazon Echo speaker at her kitchen. She uses Alexa to add milk to her shopping list which is a natural thing as it is an Amazon Alexa powered smart speaker but the next thing she did was ask Alexa to “open Cortana”. The response that came was “Cortana here, how can I help”. She then asked Cortana about her day to which Cortana responded with relevant information. She also used Cortana to send an email to the other person. So she could use Cortana from an Amazon Alexa powered smart speaker. This was important to her as all her personal information was known only to Cortana as she uses a Microsoft account for all her work. The other person, in the demo, said he was in his office. People wouldn’t take their smart speakers to the office. So what he had was his Windows 10 PC. He summons Cortana to ask where Harvest Vine is to which Cortana replies and shows him where the place is. Then he asked Cortana to “open Alexa” and the response was “Hi there, this is Alexa, how can i help”. He then asked Alexa to get him a ride to Harvest Vine. Alexa booked an Uber ride for him. So he just used Alexa on a Windows 10 PC. There are a lot of things that Cortana can do and Alexa can’t. Here, for example, he used Alexa to book a ride which Cortana cannot do. The experience is like two digital assistants inhabiting in a single device. On Windows 10 PCs, Alexa shows up in the same interface as Cortana does. In Amazon Echo smart speaker, Cortana can be heard just like how Alexa was heard. The important thing to note here is that this wasn’t just a simple integration. It is a well-planned integration where the users can have the best of both worlds. 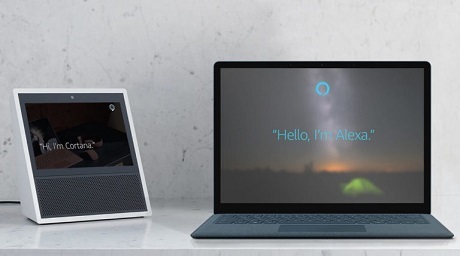 The good thing for Microsoft is that now there is no need to sell Cortana smart speakers as Amazon Echo speakers alone will also have Cortana in it.